Web Hosting News – Dallas — SoftLayer Technologies today announced the immediate worldwide availability of SoftLayer Object Storage , a redundant and highly scalable cloud storage service that allows users to easily store, search and retrieve data across the Internet, with optional CDN connectivity, or across SoftLayer’s global private network. Based on OpenStack Object Storage (code-named Swift), SoftLayer’s Object Storage solution incorporates additional features including integrated indexing and search, rich metadata, CDN support and integration into SoftLayer’s management toolset. A primary benefit of object-based storage is the role it can play in automating and streamlining data storage in cloud computing environments, particularly suited to managing and archiving large quantities of static information such as virtual machine images, graphic files and email. SoftLayer Object Storage adds a rich metadata system for describing, categorizing and indexing objects, and full search functionality for greater flexibility in object retrieval. Worldwide Storage Fabric: Storage clusters in North America, Europe and Asia, all connected via a private network provide secure data replication and transfer. Redundant Architecture: Data is written multiple times per cluster with self-healing capabilities to immediately restore data in case of drive failure. Data can be replicated across SoftLayer’s global data center footprint. Flexible Data Distribution: Highly scalable read/write access gives users the ability to serve content directly from the storage system or via the SoftLayer CDN. Consumption-Based Pricing: Per-gigabyte pricing allows customers to control costs, with no charge for private and inbound public network traffic. Powerful Management Toolkit: Full integration into SoftLayer Customer Portal, mobile applications, and a RESTful API provides full range of human or machine access. SoftLayer Object Storage is immediately available in the U.S. with global reach coming by the end of February. Prices start at 12 cents per gigabyte plus outbound network utilization. 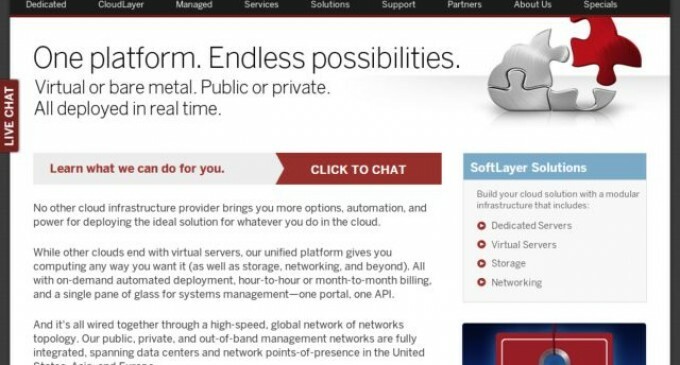 Headquartered in Dallas, SoftLayer operates a global cloud infrastructure platform built for Internet scale. Spanning 13 data centers in the United States,Asia and Europe and a global footprint of network points of presence, SoftLayer’s modular architecture provides unparalleled performance and control, with a full-featured API and sophisticated automation controlling a flexible platform that seamlessly spans physical and virtual devices, and a global network for secure, low-latency communications. With 100,000 servers under management, SoftLayer is the largest privately held infrastructure-as-a-service provider in the world with a portfolio of 25,000 leading-edge customers from Web startups to global enterprises. For more information, please visit softlayer.com or call 1.866.398.7638.